Some sixteen years ago, when I mentioned my imminent move from New York City to Washington, DC, a colleague said something along the lines of, “Well, you’re moving to what’s essentially a one-company town.” Another said, “The Jewish community is so much smaller there.” The first statement isn’t exactly true, although, of course, the federal government’s presence here in the nation’s capital is certainly powerfully felt, even for those who are not federal employees or contractors. The second was more accurate, but it didn’t deter me or change my course of direction. Then, as now, community itself has always struck me as an elusive concept, especially in a Jewish context. Is it based on synagogue membership and attendance? Membership in a Jewish Community Center? Attendance at Jewish book festivals or readings or concerts? The identity of your friends? Undergirding all of these questions is the essential one that has occupied historians, philosophers, and writers for centuries: Is Judaism a religion or a nationality or a civilization … or? The poets presented in this special Jewish Issue of Beltway Poetry Quarterly don’t necessarily provide definitive answers to these questions. Instead, they offer reflections, meditations, questions, interjections, and, above all, an insistence on naming, contributing to, and participating in the eternal Jewish symphonic debate. The poems attest to the vitality of contemporary poetic engagement with themes of Jewish life generally and the energy of that engagement in the Capital Area region in particular. When one thinks of centers of east coast Jewish life, Washington, DC might well be eclipsed by its neighbors to the North, New York City and Philadelphia, but the sheer range and force of the poems here demonstrate that our city and environs can more than hold their own in the liveliness of its Jewish poetic production. This issue is divided into three discrete but highly interconnected sections. Part I explores origins, spirituality, and textuality. In Part II, the poets grapple with the legacies of history, including the civil rights movement, the Holocaust, and the Israeli-Palestinian conflict. In Part III, the lens narrows and the focus in on family and identity. Perhaps not surprisingly, there are numerous poems here in which food serves as a concrete, textured locus for exploration of identity. Of course, many of the poems transcend a readily apparent categorization and could just have easily been placed in other sections. 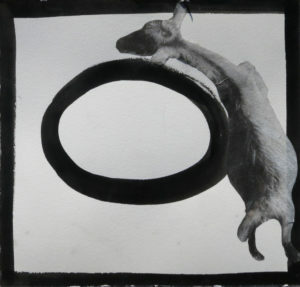 Barbara Frank, “Nigerian Goat Pretending to be a Fish to Avoid Death,” Chinese ink on paper, 11″ x 10.5″, 2017. From the “Impermanence” Series. When editor Kim Roberts and I met to discuss our selections for the issue, we did not come with a pre-set agenda regarding what qualifies as a Jewish poem. Instead, we examined each poem on its own terms, the way one would approach any poem. Does the poem succeed as a poem? Does it sing? Does it say something new? If it covers “old” ground, does it do so with fresh language and imagery? Is this a voice or a sentiment that we haven’t heard before or that we need to hear again from now? Some of the poems (“Monsters” by David Ebenbach and “Spacer” by Tanya Paperny) don’t have a readily apparent “Jewish” content. Some display a kind of discomfort with organized religion (“Interfaith” by Jean Nordhaus) or a minimal “mastery” of traditional texts (“Because I Can Mumble Some Words” by Richard Epstein). And yet, something in all of the poems bespeaks a kind of Jewish sensibility: a probing, a questioning, a spirited refusal to accept accepted dogma. In the end, we aimed for an expansive notion of the Jewish tent, and the Jewish poem, as it were. It has been a great pleasure for me to work with Kim on this issue. During the last two decades, few have done as much as Kim Roberts and Beltway Poetry Quarterly to nurture poetry in our area. Thank you, Kim, for your work. Thank you also for inviting me to be guest co-editor of this issue. Thank you to Barbara Frank for permitting the use of your extraordinary visual art appearing in this issue. Thank you to all of the poets who submitted work for consideration. I hope you enjoy these terrific poems as much as we have. The poems and the poets cover a wide spectrum of publishing experience. Some of the poems have been previously published; others are published here for the first time. Some contributors are well-established poets; others are just beginning their careers. Having these poems by such a wide spectrum of poets assembled in a single issue allows the reader to make unexpected connections between the individual poems and to reflect on the vibrancy of the Jewish poetic community in the National Capital region. Taken as a whole, the poems illustrate what I probably suspected even before I moved here and what the area’s residents have always known: that far from being a one-company town or living in the shadow of other cities, Washington, D.C. is a vibrant community with diverse, finely-honed voices. With this special issue of Beltway Poetry Quarterly, its Jewish poetic ones are now deservedly foregrounded among the many others. 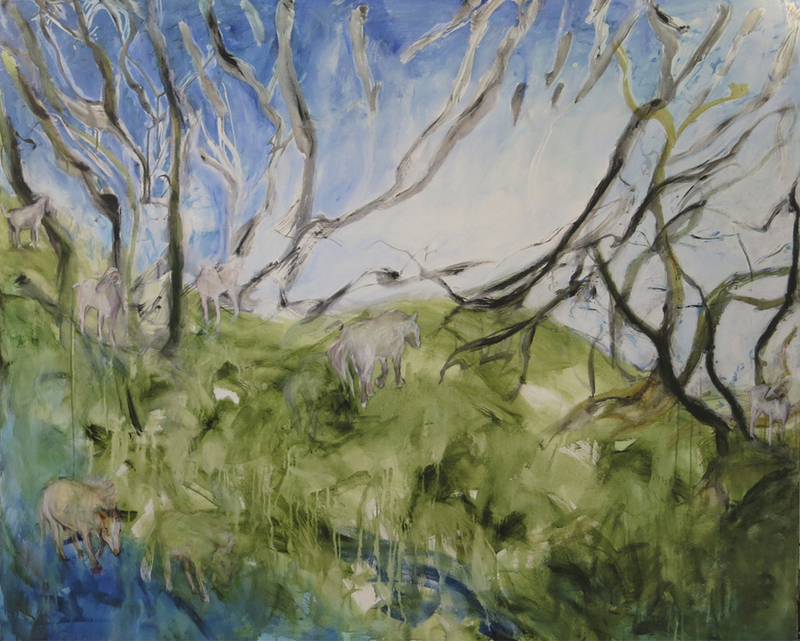 Also reproduced on the title page: Barbara Frank, “Messiness of the Promised Land,” acrylic on canvas, 54″ x 66″, 2014. All images are the copyright of Barbara Frank. Used with permission of the artist.